Located at the end of the road in perfectly peaceful Taylor's Island. The tidal marshes of Taylor's Island have been relatively untouched by the development of small towns and villages on the nearby shores. Small "islands" of loblolly pine and cedar forest dot the marsh system. 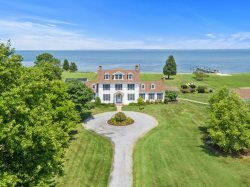 Holland Point Preserve's 200+ acres is a classic illustration of Chesapeake Bay tidal marsh habitat, overlooking the confluence of the Chesapeake Bay, Slaughter Creek and the Little Choptank River. Holland Point lodging is a marvel of architectural beauty with wide hearth pine floors, incredible exposed beams and views from every room. Originally owned by the founder of the American Hunters and Shooters Association, Holland Point affords those vacationers enamored with the outdoors immediate access to the Blackwater Wildlife Refuge, kayaking, fishing, crabbing and swimming off of the sandy shores are right out your screened porch (beware of jellyfish during parts of the summer season). The water depth at the private dock is 2' or less at low tide so kayaks and watercrafts that work well in shallow water are your best bet. We love the screen porch as well as the open floor plan. In the off seasons a roaring wood fire in the great room, dinner roasting in the kitchen and a good novel are all you need for a complete day. The Tower Room offers 360-degree views of the water and wooded surroundings. It’s the perfect place to host your friends, family, or corporate retreats. Holland Point Preserve is a "be where you are" type of vacation, pack it all in, the board games, horseshoes, fishing poles and reading material. Holland Point is designed to assist guests in forgetting there is another world of crowded beaches, boardwalks and hotels. For once, treat yourself to a vacation that you don't need a vacation from. Water Toys Included: Two (2) Kayaks. To ensure proper sizing for your group, please bring your own life jackets, or we can recommend a rental agency. Fireplace: There is a wood-burning. Firewood is provided. *****Incredible sunsets and sunrises. Back patio is wonderful for drinks and crab feasts. The river was so calm and wonderful for kayaking. What a remarkable house. Our family loved it! Had a wonderful time as we did before. Could have done without the Mosquitos , but that was beyond anyone's control. Enjoyed the wonderful seafood, the village of Slaughter Creek, trips into Cambridge and close enough for the older grandchildren to spend a day in Ocean City.